Stick to the Plan or Change It? Do I stick to the plan, or change it? If I change it, then is my plan vs. actual valid? Doesn’t it take consistent execution to make strategy work? These are valid questions. And there are no easy answers. You won’t find some set of best practices to make this easy. You’ll end up deciding on a case-by-case basis. It’s better to have a mediocre strategy consistently applied over three or more years than a series of brilliant strategies, each applied for six months or so. This is frustrating, because people get bored with consistency, and almost always the people running a strategy are bored with it long before the market understands it. I was consulting with Apple Computer during the 1980s when the Macintosh platform became the foundation for what we now call “desktop publishing.” We take it for granted today, but back in 1985 when the first laser printers came out, it was like magic. Suddenly a single person in a home office could produce documents that looked professional. What I saw in Apple at that time was smart young managers getting bored with desktop publishing long before the market even understood what it was. They started looking at multimedia instead. They were attracted to new technologies and innovation. As a result, they lost the concentration on desktop publishing, and lost a lot of market potential as Windows vendors moved in with competitive products. That argues for staying the course. Strategy takes time. On the other hand, there is no virtue in sticking to the plan for its own stake. Nobody wants the futility of trying to implement a flawed plan. You’ve probably dealt with the problem of people doing something “because that’s the plan” when in fact it just isn’t working. I certainly have. That kind of thinking is one reason why some Web companies survived the first dotcom boom and others didn’t. 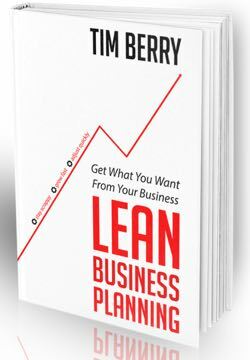 It also explains why some business experts question the value of the business plan. That’s sloppy thinking, in my opinion: confusing the value of the planning with the mistake of implementing a plan without change or review, just because it’s the plan. This consistency vs. revision dilemma is one of the best and most obvious reasons for having people — owners and managers — run the business planning, rather than algorithms or artificial intelligence. It takes people to deal with this critical judgment. One good way to deal with it is by focusing on the assumptions. Identify the key assumptions and whether or not they’ve changed. When assumptions have changed, there is no virtue whatsoever in sticking to the plan you built on top of them. Use your common sense. Were you wrong about the whole thing, or just about timing? Has something else happened, like market problems or disruptive technology, or competition, to change your basic assumptions? Do not revise your plan glibly. Remember that some of the best strategies take longer to implement. Remember also that you’re living with it every day; it is naturally going to seem old to you, and boring, long before the target audience gets it.